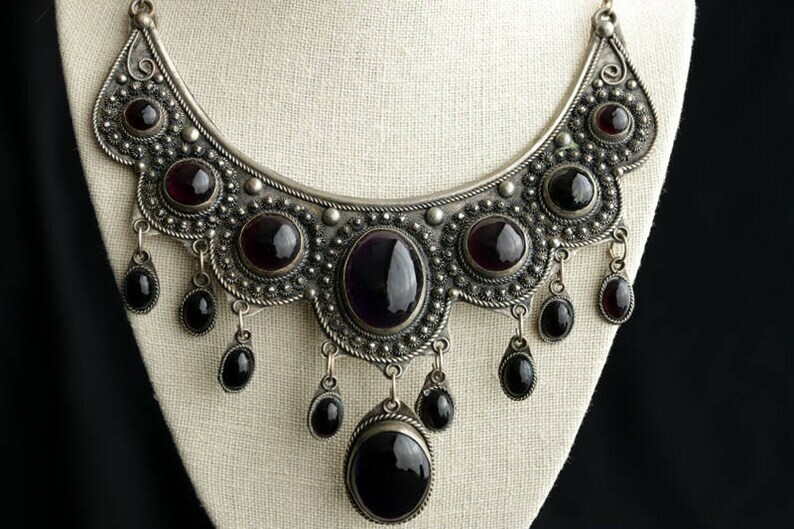 Vintage Fashion Bib Necklace. Statement Necklace in Amethyst Purple and Silver Necklace. Vintage Necklace. Vintage Jewelry. A hand crafted vintage necklace with silver tone components and a plethora of cabochons in a deep, dark shade of amethyst purple. Vintage Necklace. Olive Green Necklace. Lava Rock Necklace. Pearl Necklace. Agate Necklace. Statement Necklace. Beaded Necklace. Vintage Flower Bracelet. Brass Bracelet with Rhinestones. Vintage Jewelry. Size 24 Dark Brown Plus Size Womens Dress Slacks. Pants. Trousers. Cloisonne Vintage Bracelet in Black with Flower Shell Inlay and Alpaca Silver. Vintage Jewelry. XL Floral Print Womens Skirt. Vintage Handmade Plus Size Skirt in Hawaiian Print. Vintage Bangle Bracelets. Vintage Costume Jewelry. Turquoise and Ivory Lucite. Please include your name and return address inside the package when returning so that I can look up your order and process your refund once it arrives. No refunds will be processed until the returned item arrives back to me. Your shipping charge covers all shipping and handling expenses including postage, envelope, packaging, and padding to ensure your purchase arrives undamaged. When applicable, I refund shipping charge overages in excess of $1.00 USD after an order has shipped. All items listed for sale are from a smoke-free environment. If you have allergy concerns pertaining to items that you're interested in purchasing, please feel free to contact me. I'm happy to answer any questions you may have. If this is an issue for you, you may wish to look into using a United States based forwarding service.